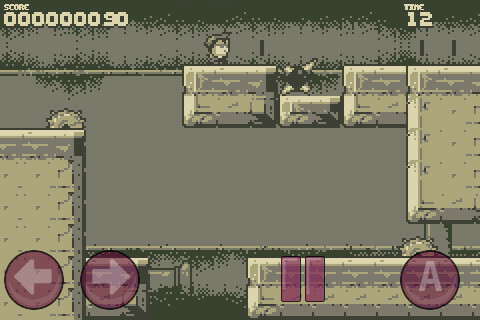 Although the majority of modern iPhone games revolve around complex first person shooters or role-playing games, many fans prefer old-fashioned genres such as 2D platforming games. For those who have an iPad, iPod touch, or other mobile device and are looking for a good platformer, one of the best games available is Stardash. Although many platforming games tend to share similar characteristics with each other, there are many aspects of Stardash that separate it from any other iPhone app in the genre. For one thing, Stardash is extremely challenging compared to similar games. Movements by the player must be incredibly precise in order to maneuver the character successfully and even a slight mistake can lead to imminent death. For many players, the extra challenge will be appealing and will make the app more enjoyable than others. For those who become frustrated easily and prefer games that can be beaten without difficulty, however, this app will be far too challenging. Another aspect of Stardash that sets it apart from other games in the genre is the fact that each level has a time limit on it. Due to the fact that players must make very precise movements, many people would likely wish to play very slowly and take their time in order to minimize any chance of mistakes. Unfortunately, those who do not move quickly will run out of time and be forced to start the level over again. This is another element that adds to the overall difficulty of the application , making it even more appealing to those who love a challenge and even more frustrating to those who do not. One particularly favorable part of Stardash is the ability to find a hidden key in every single level. After finding every key in a world, a bonus level becomes available which is even more difficult than the standard levels. This ability to find hidden keys is something that is not commonly found in platforming games and does contribute to the uniqueness of Stardash. Unfortunately, the keys can be very difficult to find at times and are not in obvious places. Players will have to look very closely at each of the boxes and walls across the entire map in hopes of stumbling across the hidden keys and gaining access to the bonus levels. Overall, Stardash is a very enjoyable game , but is definitely not for everyone. Players who prefer less difficult games should not even attempt Stardash, as it will undoubtedly be too frustrating. For those who are looking for a truly challenging platforming game that will require patience and practice, however, look no further than Stardash. AppSafari review of Stardash was written by Darius Reimm on October 15th, 2011 and categorized under Action, App Store, Arcade, Games, iPad apps, Platformer, Universal. Page viewed 3547 times, 2 so far today. Need help on using these apps? Please read the Help Page.